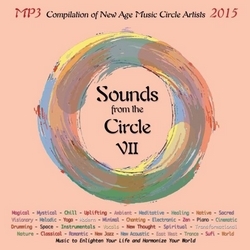 The New Age Music Circle – an online community of over 1700 artists, industry professionals and fans – presents its seventh MP3 compilation in as many years with Sounds from the Circle VII. Produced by Suzanne Doucet, founder of the Circle, the compilations have become favorites among music fans as well as professional radio programmers and wellness practitioners who appreciate the ability to play almost four hours of music without stopping. Just a sampling of the New Age music sub-genres included are Mystical, Chill, Ambient, Meditative, Vocals, Nature, Trance, World, Solo Piano, Space, Electronic and more! Sounds from the Circle VII is available in both physical format and duplicated in online playlists in Spotify and iTunes for all tracks available there by our launch date of 5/12/15. The Sounds of the Circle compilations are always eclectic, showcasing the wide range of inspiration, interpretation and musical vision within the New Age genre from countries across the globe including the USA, Canada, Australia, Brazil, England, Scotland, India, New Zealand, Norway, Sweden, Germany, Malaysia, South Africa, Spain, Venezuela and more. We are pleased to make you discover it on Radio PLENITUDE, every day, from june17 until june 30, before it enters in a regular programming.